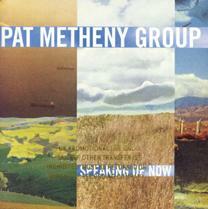 George Graham Reviews the Pat Metheny Group's "Speaking of Now"
Jazz-rock fusion is not a style that one hears a great deal these days. Many jazz musicians who performed fusion have gone back to acoustic instrumentation, or else even further afield toward hip-hop. Meanwhile, the so-called "smooth jazz" sound of people like Kenny G have none of the fire and creativity that marked the best of the fusion scene during its heyday in the 1970s. But one ensemble that has been consistently keeping the style creatively fresh, and remaining surprisingly popular in the process, is the Pat Metheny Group, who this year mark their 25th anniversary. They have just released a new recording, their first in over four years, called Speaking of Now. Rarely has a band been as innovative in their field as the Pat Metheny Group. Metheny, growing up in Missouri, started on trumpet but switched to guitar, and soon became something of a jazz prodigy, teaching at the University of Miami and the Berklee College of Music while still in his teens, the youngest faculty member at each. He came to the attention of the music world as a member of vibist of Gary Burton's group, in which his distinctive style of both playing and composing soon became apparent. While the jazz rock fusion scene of the day -- in the mid 1970s -- was influenced by the maximum volume guitars of the Mahavishu Orchestra and Miles Davis' groups, Metheny adopted the then-new technology of digital delay effects to create a much an almost transparent, shimmering electric guitar sound that allowed much more subtlety, and lent itself to interesting harmonic textures. Metheny began working with Wisconsin-born pianist Lyle Mays in about 1977, and they soon became a symbiotic musical partnership. They created music that exploited the sonic clarity of their approach, with Mays concentrating originally on acoustic piano, jointly composing music with constantly shifting harmonic colors that combined complexity with a very appealing sound. It marked a considerable departure from the very electrified sound of the fusion of the day. Over the years, the Pat Metheny Group has released a series of acclaimed CDs -- in fact they are the only band to have received Grammy Awards for every one of seven consecutive albums. They have become more electric, with Mays employing synthesizers, and Metheny in the 1980s adopting the Synclavier guitar, but the group's sound remains rooted in the original concept of the band based on their interesting musical textures. The Group's members frequently engage in side projects, especially Metheny himself, who has done a series of jazz albums from straight-ahead to very challenging. The band had been on hiatus since their last tour following their 1997 CD Imaginary Day. Metheny and Mays reunited last year to create new music, and with the time apart came a change of personnel. While long-time bassist Steve Rodby remains with the group, nearly 20-year veteran drummer Paul Wertico departed. Metheny sought out Antonio Sanchez after hearing him play at a jazz festival. The 31-year-old Mexican-born drummer also studied classical piano and was a graduate of a National Conservatory of Music in Mexico, before winning a scholarship to the Berklee College of Music in Boston. He began a jazz career which had him performing with such artists as Danilo Perez, Paquito D'Rivera and David Liebman. Metheny has high praise for Sanchez, noting his wide-ranging musical interests and abilities. A surprise addition to the group is Richard Bona, the Cameroonian-born bassist and vocalist who has released two fine albums of his own. With Rodby remaining in the bass position, Bona assumes the role of vocalist and percussionist. Despite his own career, Bona jumped at the chance to be part of the PMG. His plaintive mostly wordless vocals add much to the sound of the revised group, which for years has had members who provide vocals as a texture, rather than as conventional singing. Rounding out the group, and adding further to its cultural diversity is trumpeter and vocalist Cuong Vu, a Vietnamese native who had been part of the New York experimental jazz scene. Again, as in the case of Sanchez, Metheny sought out Vu after hearing a recording of him, and being struck by his musicianship. While the Metheny Group was quite a departure from what Vu had been playing previously, he was also a fan the Group and was quick to enlist. The addition of the new members influenced the writing that Metheny and Mays did, incorporating not only their instrumental strengths but also their cultural influences, further widening the sound of the group which since the late 1980s has been encompassing world music influences. So Speaking of Now is one of the most interesting and wide-ranging CDs the Group has done. This CD favors longer elaborately arranged compositions with the constantly shifting colors and moods which are a trademark of the PMG. Unlike many fusion or jazz combos, that rely on improvisation beyond the statements of the melodic themes, the Pat Metheny Group's material consists of elaborate and often intricate arrangements, which do allow some room for improvisation, but are full of interesting twists and turns, changes of mood, effective use of dynamics, instrumental colors and the like, than can really take one on an imaginary journey of the listener's own design. And like past Metheny/Mays compositions, there is a deceptive quality to the music that makes some mind-bogglingly difficult compositions and arrangements flow easily and naturally in a very appealing, melodic sound. So one can just put on the music and hear the nice sounds, or one can sit down and listen to the remarkable stream of fascinating musical ideas unfold, often in unexpected ways. While the outward sound of Speaking of Now is reminiscent of the group's last album, the new personnel, the textures they bring, and the emphasis on the more extended compositions makes this a particularly engaging album, even for this remarkable Group. The Pat Metheny Group have been innovating in jazz-rock fusion for nearly 25 years now. In some ways, they have the field pretty much to themselves, but they are not wont to rest on their laurels. After an over three-year hiatus, Metheny and Mays have recruited new members and created music to exploit the talents of the new additions. As usual, the Group's brilliance not only comes from their instrumental talents, but to a great extent from the remarkable compositions and arrangements they create, with a seemingly inexhaustible supply of interesting thematic, harmonic and rhythmic ideas, woven into works of almost symphonic scope, and yet that are almost always attractive to the casual listener. Our grade for sonic quality is an unequivocal "A." Engineer Rob Eaton, who has been working with the band for many years now, has always been able to capture the subtlety of the group's sound. But the last Metheny Group CD, Imaginary Day was ruined by excessive compression in the mastering process that undid all the group's attention to dynamics. This CD is a wonderful antidote to that, and for that matter, most of today's pop CDs. Speaking of Now's recording captures well the ebb and flow of the music from the softest passages to the loud, so when the group builds to a crescendo, it really has an impact. Compared to the overly compressed tin-ear sound that has become almost mandatory in a world where music seems to compete only on loudness, you'll have to turn up the volume a little when listening to the CD on your stereo at home, but you'll be well rewarded. When I first gave Speaking of Now my cursory radio programmer's quick scan, I thought to myself that the group sounded pretty much the same as before. A detailed listen belies that first impression. This is music that is many layers deep -- attractive on the surface, but full of intricate detail and musical sophistication that will reveal a little more of itself at each succeeding listen. This is another masterpiece from a group who have taken fusion music, in its broadest sense, to ever higher levels.